A math trail is an activity that gets students out of the classroom so they can (re)discover the math all around us. Whether out on a field trip or on school grounds, students on a math trail are asked to solve or create problems about objects and landmarks they see; name shapes and composite solids; calculate areas and volumes; recognize properties, similarity, congruence, and symmetry; use number sense and estimation to evaluate large quantities and assess assumptions; and so on. This is one of those creative, yet authentic activities that stimulate engagement and foster enthusiasm for mathematics—and so it can be particularly useful for students in middle and high school, when classroom math becomes more abstract. A math trail can be tailored to engage students of any age and of all levels of ability and learning styles. Its scope and goals can be varied, and it can include specific topics or more general content. And best of all, it can make use of any locale—from shopping malls to neighborhood streets, from parks, museums, and zoos to city centers, to name a few. Any space that can be walked around safely can work. My school has used a ready-made math trail designed by the Mathematics Association of America. Although it’s designed for Washington, DC, its general ideas can be applied in any city or town. It could be particularly appealing for teachers because it’s open-ended and can be tailored to the curricular and educational needs of the students. In addition, as schools from all over the country visit the nation’s capital, it provides a math activity that can be easily added to the many history, art, and civics lessons elicited by such a field trip. Our math trail is loosely structured on purpose: As the whole Grade 7 takes part in this trail and as many chaperones are not math teachers, we make it clear that the purpose of the day is for the students to explore, discover, enjoy, and celebrate the beauty of math and its presence all around us. Using the MAA’s Field Guide and a map of the National Mall, each group spends the first hour of the day planning their route. How they spend their time is up to each group—this freedom is what the students like the best about the day. 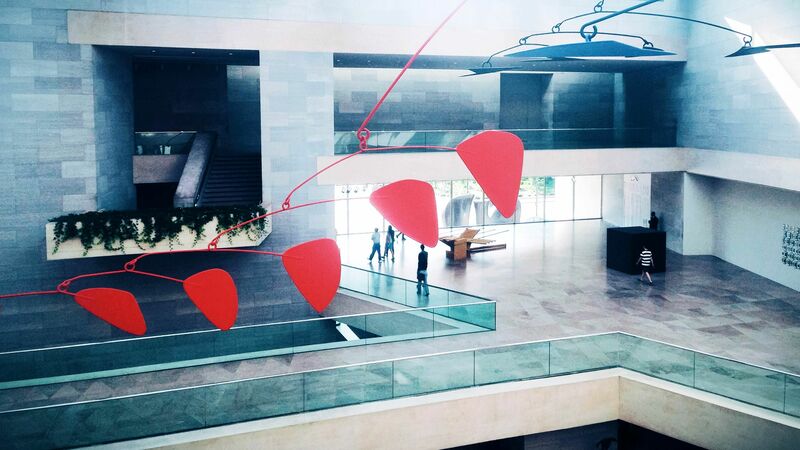 Some students want to visit the newly renovated East Building of the National Gallery of Art—a treasure trove of 2D and 3D geometric ideas, patterns, and artifacts. Can we calculate or estimate the volume of its octagonal elevators or triangle-base stairwells? Even without measuring tape? Others can’t wait to ride the Mall carousel while thinking of the trigonometric function the ride’s motion describes. Other students look at a more pressing problem: Considering the scale of the map, what is the shortest route to Shake Shack from the Sculpture Garden? Is that path unique? Is the distance the same in Euclidean geometry? Walking at a fast pace—say 4 mph—how long will it take to get there? Can we get our food and make it back to the bus on time? Another group might estimate how many people visit the Air and Space Museum in a day. And how do we go about solving this problem? 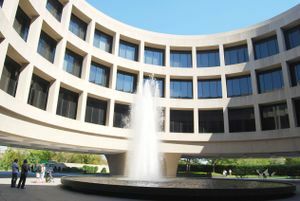 In Washington, DC, students can use their math skills to discuss architectural elements like the curves at the Hirshhorn Museum. 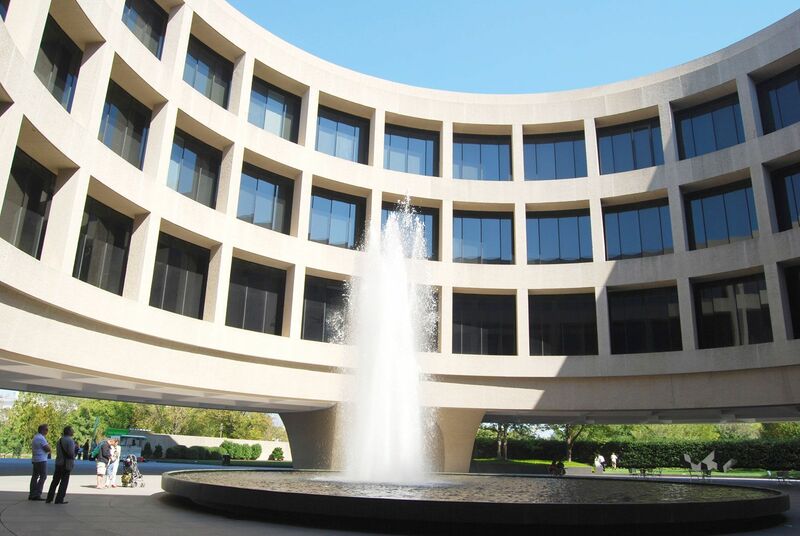 Another group will examine the shape of the Hirshhorn Museum complex. Why does it look so appealing? Where do we see symmetry in the World War II Memorial? Where do Fibonacci numbers and/or fractals appear in the National Garden? What’s the scale of the Voyage model of the solar system along Jefferson Drive? Given that scale, can we estimate the distance between Mars and Saturn? Turning our thoughts back to Earth, how is the map of Washington, DC, structured? If transferred to Cartesian coordinates, what is the origin? The possibilities—in DC and in your town—are probably endless: Teachers can tweak all of these questions to fit other contexts. Each group visits various sites and takes photos, and after we’re back at school the students research the mathematical significance of the symbols or objects they’ve chosen, write and/or solve the problems they posed, annotate their photos and post them on an electronic bulletin board or map of the Mall, and express what they’ve learned and enjoyed in other creative ways such as movies, kahoots, songs, game shows, etc. These projects are shared at a later time in assembly and affirm the fun mathematical times. There are many excellent resources about math trails, including already created trails and virtual trails as well as clear directions on how to create your own. Math trails are cooperative—not competitive, as mathematics learning is often seen—and they offer the opportunity of doing and talking about math. Making and using connections among mathematical ideas, recognizing and applying mathematics in contexts outside of math class, communicating mathematical thinking to others clearly, and analyzing and evaluating the mathematical thinking and strategies of others are all basic tenets of the NCTM process standards. The collaborative nature of a math trail makes it a great opportunity for bonding. After our first math trail, we understood better the potential of this activity and realized that it could be integrated in our seventh grade Advisory program, particularly at the beginning of the school year, when it can help facilitate the transition into middle school.